Virtual Reality and Augmented Reality in Property Marketing – Can you Believe the Hype? If you’re looking for engaging ways to present your new developments to potential buyers and investors, you may be wondering about Virtual Reality and Augmented Reality. These two technologies have generated quite a bit of excitement among estate agents and property professionals recently – ourselves included. But how much of that is hype, and how can you actually put these technologies to work in your next marketing campaign? At iCreate, we’re passionate about innovation, but we don’t believe in recommending new technology for its own sake. We are interested in how new technology can help you achieve your goals – whether you’re selling new homes off plan, selling new commercial spaces, or sharing your vision for large redevelopment projects. VR and AR – what’s the difference? Virtual Reality and Augmented Reality are both referred to as ‘immersive’ technologies, because, once you’ve put on the headset, you are ‘immersed’ within the 3D environment. Sophisticated motion-sensing technology tracks the movement of your head as you look around, so you really feel like you’re standing in a new environment. The key difference between Virtual Reality and Augmented Reality is that AR allows for computer generated elements to be overlaid on your view of the real world, whereas VR replaces the real world with a wholly virtual environment. The user experience is quite different. A VR headset blocks out your view of the real world completely, so to all intents and purposes you are no longer in the room. This makes the experience wholly engaging and completely immersive – you are ‘transported’ to somewhere new, and your subconscious mind really seems to believe you’re ‘there’. But it can be a disorientating experience for some people, and we’ve been surprised at some of the reticence we’ve encountered among people who are either too embarrassed or too nervous to put the VR headset on. While we believe the experience is worth it, and that it will become more ‘normal’ as time goes by, we certainly recommend that our clients provide alternative means of viewing the same content for all those people who simply won’t put the headset on! An AR headset, like the Microsoft Hololens, is more like a high-tech visor, so you can still see everything in the room around you. This makes it much less disorientating – and there’s definitely a reduced risk of falling over! Virtual elements are inserted into your real-world view, ‘augmenting’ your reality rather than replacing it altogether. Which one will work for you? There are lots of applications for which Augmented Reality is a truly exciting opportunity, but for us, when it comes to property marketing and selling new developments ‘off plan’, it’s really all about Virtual Reality at the moment. 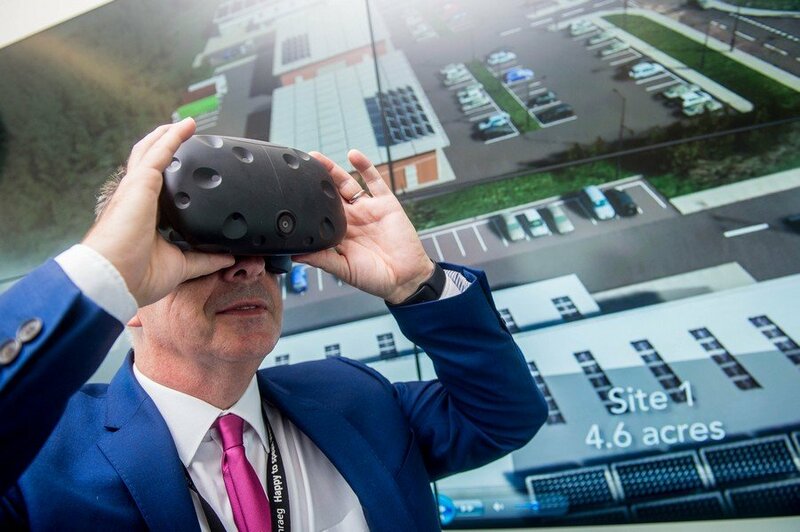 VR provides the ability to transport yourself into the future and see what a proposed new development will look like. More than that, it gives you a sense of what a new development will FEEL like, because your subconscious mind is ‘tricked’ into believing it’s real. It’s this level of emotional engagement that we think makes Virtual Reality particularly effective for property marketing. Quite unlike watching content on a flat screen, with VR you form a memory of actually ‘being there’ – this, for us, is pretty exciting. If you would like to the discuss ways in which your business could benefit from VR or are interested to find out more about the services we can offer then get in touch. We have some great examples of previous work on ourwebsite too. We challenge you not to get excited, it’s impossible! iCreate has worked for 15 years with hundreds of clients, including property developers, Architects and Marketing Agencies across the UK. We produce Images, Animations, Flythroughs and marketing packages. Our Firm works with companies and businesses looking for marketing materials with impact, that help to sell our clients schemes. Working with clients around the world, we're always striving to produce quality innovative materials that work, helping our clients to become successful and allowing all stakeholders to aim for the same vision. Virtual Reality and Interactive Real Estate Marketing - 3D Animation and CGIs & VVMs for Planning - CGI Company - Photo Montage and VVMs (Visually verified montages) - 3D Architectural Visualisation Animation and flythroughs - Virtual Reality and 360 - Full Real Estate Marketing Packages and 3D Architectural Visualisation & Illustration - Working with clients in New York, Miami, Philadelphia, USA, East Coast, London © 2018 icreate - UK Company Number: 4963194. VAT Number: 850540642 | @ 2018 Copyright iCreate Ltd. All rights reserved.